Fences are so common around homes that we take them for granted. What role does a fence play anyway? A fence can be pretty or not but it does offer security and privacy to a home owner. If your property doesn’t have a fence, how do you decide which one is needed? There are so many choices in fencing styles and materials that it can be hard to decide. Chain link fences: These are the most useful and inexpensive to get installed. Most people get these in the backyard. The only disadvantage to this type of fencing is that it is not very attractive to look at but it does a good job of providing safety. Lattice work: This is a good choice for a modicum of privacy and good airflow in specific areas. Wrought iron: There are a lot of choices in this area as well and they add a touch of class and elegance to any architectural style. Most often than not, they are used for adorning landscapes. Wood fencing: Of all the available choices, this is the most popular and most ubiquitous. It is affordable and lasts a long time, with a bit of care. Wood fences provide privacy and also a bit of a buffer from noise. Picket fences: This is another classic choice of many – a pretty front yard with a picket fence. This fencing option offers security to families with pets and children, a bit of privacy and also establishes boundaries. 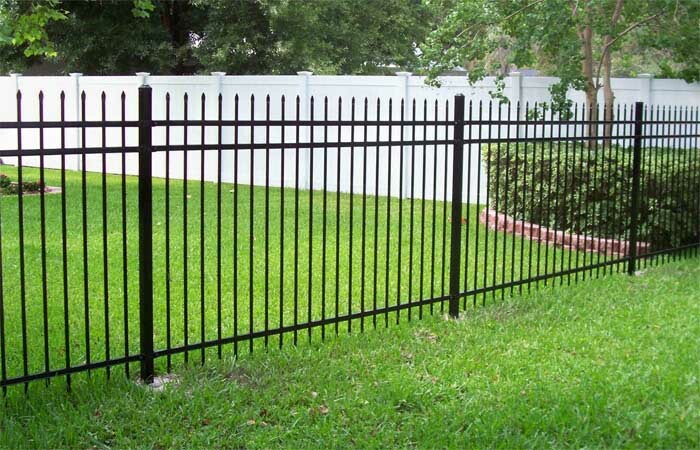 Stockade fences offer the best kind of privacy and also form a total barrier. Make sure that the fence around a swimming pool in your backyard meets safety regulations mandated by the city and state you live in. Factors like height, ground clearance and spacing have to meet requirements – check with the municipal department and make sure they are up to date. When in doubt, hire a contractor who is familiar with fencing to do it so that it is done properly. If you live in a big city and a neighborhood, the first order of business is to check with the homeowner’s association. They will be able to provide information on rules and regulations about fences, types, permits and where to get them. Many people choose shrubs and trees to form natural fences. Privet hedges are a great way to create privacy with the same kind of monetary investment. The only thing to ensure is that they are within the perimeter and keep neat and tidy by trimming. It is a good idea to talk to the neighbors and find out what they have to say. It may work out that they share the expense of putting up a fence along property lines. Make sure to get everything in writing, especially clauses on property borders and financial payments. This helps to avoid future problems. The first thing to do is to decide what you want the fence to do. Consider the following points before making a decision to go with the Fence Company Atoscocita Texas. Is curb appeal the driving force to get a fence? Is traffic noise bothering you? Do you have children and pets? Is their safety a concern? Do you live out in the country? Do you have deer eating your shrubs and destroying your landscaping? Do you have a swimming pool which has to be secured from little kids? Once any or all of these questions have been addressed, the next step is to choose what suits your budget and needs.